"Soy" was released in 2015 and is a recompilation of 13 of the band's biggest hits and includes three new songs. It is more than a greatest hits compilation because most of the songs have been re-recorded for the album, although the arrangements haven't been changed. It gives the listener a feel for what the songs currently sound like in concert with only subtle differences from the original albums. The track listing below indicates the album on which the songs were originally recorded. "Soy" is a great introductory album if you want to introduce new fans but the three new songs also give the long term fans something new. The selection of songs relies heavily on the more recent repertoire from the CDs "Pi 3,14" (2011) and "Dial" (2013) featuring three songs from each. They couldn't leave out songs such as their first hit from 2001 "No juegues con mi soledad", "Catalejo", "Soy", "En Cueros" and their ode to ladies' buttocks "Nalgas". The songs that have changed most from the original version are "Volar sin ti" and "Miedos". "Volar sin ti" was recorded on "Dial" with Galician singer-songwriter Andrés Suárez and on "Soy" those vocals are preformed by Yoel Martínez. "Miedos" was originally recorded on "Pi 3,14" with the rap section performed by Los Aldeanos. Electric guitarist Dairon Rodriguez is now the rapper both in concert and on "Soy". 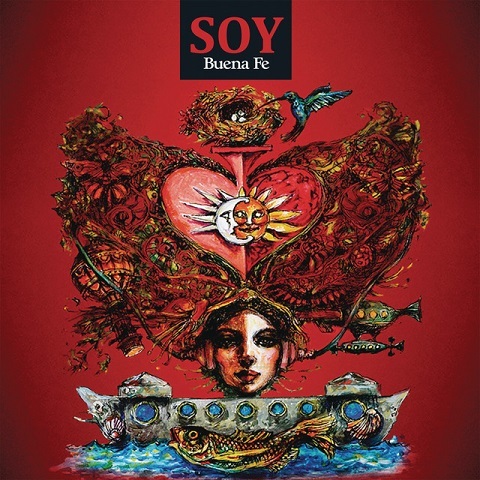 The first of the new songs that Buena Fe has offered us is "Dame Guerra" and is a man telling his partner that she should fight with him every so often "for being a liar, for being stingy". "I prefer you proud and wild than trampling a love without roots" not to mention that he looks forward to making up. The video won Best Video at the 2016 Lukas Awards - the Cuban equivalent of the MTV Video Awards. Check it out below. "Casanova, Cecilia Valdés y la Bella Durmiente" is a collaboration with singer-songwriter Frank Delgado and a funny story about unexpected consequences. Casanova tells Cecilia Valdés that she needs to keep up with the times and let him bring another woman into their relationship. So she suggests Sleeping Beauty, thinking that the girl will be too lazy to be a threat. But when they all get together, the ladies decide they have no use for Casanova and he's left out in the cold. "Si está bueno el pan con salsa, se sobra el perro caliente" if the bread with sauce is good, the hot dog is left over. The album ends with the exquisite secular hymn "Oraré". Rojas and Martínez sing the song as a duet with a beautiful choir on the chorus. Check it out below. The album is available at digital retailers and on streaming apps, and the hardcopy can be purchased online from Target and Amazon.